In Richard Kelly's definition, the concept of "ambient luminescence" recalls "the unbroken light of a snowy open country morning or the dusk on a river where the banks, water and sky come together". In other words, ambient light includes everything we know about diffuse and indirect lighting. Ambient lighting produces a light without shadows that minimizes shapes and volumes and reduces the importance of objects and people, suggesting the ideas of infinity, freedom, space and sending the reassuring feeling of a welcoming and serene ambiance. "Ambient luminescence" therefore means basic light, the light needed to see, to perceive space, to orientate ourselves and get the global picture. Ambient lighting is the foundation of a lighting system, but not necessarily the departure or arrival point of the project. As a matter of fact, in a confined space, ambient light may be comming from different points of accent lighting or from fixtures positioned and designed to illuminate only certain areas of activity. 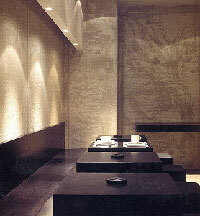 Even in larger spaces, ambient lighting is only one of the needs or functions that a lighting project should fulfill. A uniform and diffused light does not mean providing an undifferentiated illumination for every spaces and contexts, but rather looking for the appropriate solutions to the different needs that each specific environment requires, depending on the activities that must be carried out. At home, for example, the lighting varies between living area, sleeping quarters and areas, such as the study or the kitchen, where the tasks that are carried out require more attention and concentration, and thus greater illumination levels. Similarly, the ambient lighting requirements for a living room differ from those of an office or other work space. And, in that case, the requirements vary according to the type of activities, the space and its usage.